As she harvests her 33rd vintage as a winemaker, Merry (Meredith) Edwards has become deservedly widely known as the “Queen of Pinot.” Throughout her career, which began at Mount Eden in 1974, she has made some benchmark California Chardonnays, Merlots and Sauvignon Blancs. But her passion is Pinot Noir, her heart is in the Russian River Valley, and her legacy will say she was the first woman to make a really credible Pinot Noir in California. Edwards grew up in Southern California and went north to University of California Berkeley to study physiology. Her interests shifted to food science and enology and she transferred to University of California Davis to complete her education. Her first job was as the winemaker at Mt Eden in the Santa Cruz Mountains in 1974. This was a winery made famous by Martin “Rusty” Ray who first planted Pinot Noir at the top of Mount Eden in the early 1940s. Edwards produced now legendary Pinot Noirs from 1974-1976. Her pioneering work in clonal selection while at Mt Eden led to the now widely planted UCD 37 certified clone of Pinot Noir. Her work at Mount Eden was remarkable for the time, because there were few winemaking jobs offered to women and only a handful of notable Pinot Noirs were being produced in Northern California. It was a time for discovery. Joe Swan released his first Pinot Noir in 1973, Davis Bynum bottled his Rochioli Pinot Noir in 1972 from vines Joe Rochioli planted in 1968, Bob Pellegrini planted the Olivet Lane Vineyard in 1972, and Tom Dehlinger, Forrest Tancer at Iron Horse, and Marimar Torres were starting their own Pinot Noir programs in the Russian River Valley. In 1977, Edwards left Mt Eden and moved on to Matanzas Creek, which she led to the top echelon of California wineries. Briefly she had her own project, Merry Vintners (now DeLoach Vineyards), and was a principal and winemaker at Domaine Laurier, both of which turned out to be financially unfeasible. She also made wine for Liparita, Fritz, and Lambert Bridge. She crafted Pinot Noir for Olivet Lane Vineyard (Pellegrini Family Vineyards) for a time and continues to source grapes from this heritage vineyard. In 1996, she finally found stable footing and a vineyard of her own when she purchased a 24-acre fruit orchard in the southern part of the Russian River Valley and formed a partnership with her husband, Ken Coopersmith and others, under the Meredith Vineyard Estate name. She planted this property in the Sonoma Coast appellation in 1997 with a field selection of Swan and her own UCD 37 along with three clones from Burgundy. Her first vintage from Meredith Estate Vineyard was 2000. 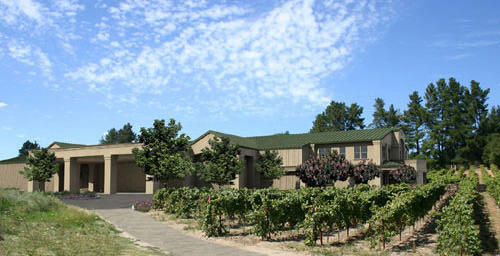 In 1999, Edwards purchased the 9.5 acre Coopersmith Vineyard in the Russian River Valley. In addition to the Meredith and Coopersmith vineyards, she now sources Pinot Noir from Olivet Lane Vineyard, Klopp Ranch Vineyard and Tobias Glen Vineyard, all located in the Russian River Valley. Her Sauvignon Blanc, made in the popular style she developed many years previous at Matanzas Creek, comes from two Russian River Valley vineyards. Edwards releases seven Pinot Noirs and one Sauvignon Blanc under the Merry Edwards Wines moniker. The Russian River Valley and Sonoma Coast appellation bottlings and the Oliver Lane Pinot Noirs are Spring releases, and the four other vineyard-designate Pinot Noirs are released in the Fall. Production in 2006 is expected to be 15,000 cases. Most of the Merry Edwards wines are sold to an eager mailing list and a lengthy list of restaurants. The name Merry Edwards is among the most popular restaurant labels and has a similar caché as Sonoma-Cutrer and Cakebread on restaurant wine lists. The Fall 2006 release wines were listed in the PinotFile, Volume 5, Issue 48. Currently, tasting is available by appointment at the business office in Windsor, but ground has been broken on a new winery to be constructed on the Coopersmith Vineyard property, expected to be completed for the harvest in 2007 (below). Edward’s winemaking emphasizes careful vineyard management, punch downs in 6.5 ft x 6 ft fermenters, and generous use of new oak barrels. Her style has been described as “sporting lavish dark fruits, powerfully concentrated, jammy, and brimming with sweet oak.” All of her Pinot Noirs retain a distinct sense of place, a feature that stems from her pioneering work on clonal diversity and importance of site (terroir). I first met Edwards in 2002 at a wine dinner in Orange County, California, at Mr Stox Restaurant . At that time, I was privileged to taste some of her early Merry Edwards Pinot Noirs: including the 1999 Merry Edwards Klopp Ranch Pinot Noir and 1999 Merry Edwards Windsor Gardens Pinot Noir (Windsor Gardens unfortunately has been subsequently bulldozed for home development). Both were outstanding with the Windsor more feminine and my favorite. I also sampled the 2000 Merry Edwards Russian River Pinot Noir, the 2000 Merry Edwards Meredith Estate Pinot Noir (from fourth-leaf vines and a little light but promising), and the 2000 Merry Edwards Olivet Lane Pinot Noir ( my notes say “wonderful” and that pretty much sums up this vineyard source). I was impressed with her passion for Pinot Noir. She has become a spokesperson for Pinot Noir in general and the Russian River Valley in particular. Since that wine dinner, I have been enamored with several of her Pinot Noir releases (especially the Olivet Lane), but I have found some wines too ripe, oaky and tannic on release. I wish now I had aged a few bottles to see how the spirit of these wines develop over time. I recently tasted through the Spring lineup of Merry Edwards wines and my impressions are on the following page. The wines are sold through a mailing list at www.merryedwards.com. 14.1% alc., $27 A unique example of this variety sourced from thirty-year-old vines at Hopkins Starr Road Ranch and the Cohen Vineyard, west of Sebastopol. Both vineyards are planted to the Sauvignon Musque clone. · This pale strawcolored wine has a nice nose of tropical fruits, herbs and roasted nuts. Good acidity and a mildly creamy texture. I get a little smoked fish on the clean finish. A workhorse Sauvignon Blanc that everyone needs in the cellar for shellfish and white fish dishes. 14.1% alc., $30. The grapes for this wine were sourced from the Meredith Estate Vineyard. Aging was in 63% new French oak for 10 months. · This beauty attacks the nose with dark cherries, spice box, and a kiss of oak. The flavors follow in step with added earthiness, tea, and luscious tart red fruit flavors. The balance is perfect. Plenty of finesse here, but not a “girlie” wine. The finish explodes in the mouth. 14.2% alc., $36. Sourced from five Russian River Valley vineyards including Meredith, Klopp and Olivet Lane and aged 10 months in 52% new French oak. · The aromatics feature dark crushed cherries and toasty oak. This medium-bodied wine has a plenty of structure and notable flavors of dark stone fruits and rhubarb. The finish is marked by smoke, generous oak and slightly bitter tannins. An oak lover’s dream. 14.3% alc., $57. This heritage vineyard is over thirty years old and still pumping out quintessential Russian River Pinot fruit. Merry Edwards has been making Olivet Lane Pinot Noir since 1989 and this may be her best vintage yet. This Pinot Noir was aged 10 months in 80% new French oak but you would never know it as the oak is so well integrated. · A reference standard for Russian River Valley Pinot Noir. Oh that Bing cherry and cola and Asian spice. Demure and perfectly balanced. A finish that is ridiculously long. Lively acidity brings out the fruit beautifully. This is why I get excited about Pinot Noir. This is a wine you want to go one on one with - find a time when you are alone, uncork a bottle, and spend the evening in a monogamous relationship. Nearly all of the Pinot Noir grown in Champagne goes into one of three styles of Champagne: nonvintage brut, vintage brut, and rosé. Champagne does produce a small amount of still Pinot Noir labeled as Coteaux Champenois. In Burgundy, production is 105 million bottles of Chardonnay and 75 million bottles of Pinot Noir annually. There are 4,000 Domaines in the Cote d’Or which stretches 31 miles and has 59 different types of soil. Just when you least expect it, something comes along that knocks your socks off and reaffirms your belief and trust in the small artisan producer of Pinot Noir. While in Oregon for the IPNC this past summer, I heard a little buzz about Le Cadeau Vineyard. I tucked it away in the back of my mind until I recently came across a bottle at a local wine store (Hi Time Cellars in Costa Mesa, California). I bought a bottle based on my recollection and was I surprised! The initial releases from 2002 and 2003 have attracted many fans. The wines were vinified by Isabelle Dutartre, a French winemaker who assisted Veronique Drouhin at Domaine Drouhin for five vintages. Dutartre was trained in classical Burgundian enology and viticulture in Beaune, France, and has also worked extensively at Maison Joseph Drouhin. She is one of France’s leading experts on wine barrels and is a consultant for a famous French oak barrel producer. She currently resides in France, but travels frequently to Oregon to oversee winemaking at two family-owned wineries, DePonte Cellars and Lachini Vineyards. Dutartre left Le Cadeau after the 2003 vintage, but she may remain in a consultant capacity. In 2004 and 2005, there were three bottlings from Le Cadeau Vineyard made by three different winemakers: Sam Francis and Cheryl Tannahill (Francis Tannahill), Josh Bergstrom (Bergstrom), and Harry Peterson-Nedry (Chehalem). Production is tiny so far, with 630 cases in 2003, 480 cases in 2004 and 750 cases in 2005. 14.6% alc., 630 cases, $40. · This Pinot Noir is rich and vivid and reflective of the warm vintage in Oregon. A full and opulent nose of dark cherries, espresso, and oak really draws you in. There is a hint of alcohol which is not intrusive. The flavors echo the aromatics, with added raspberries and chocolate for good measure. There is detectable minerality at work here also. The mouth feel is plush and silky, the tannins finegrained. Oak treatment is very judicious. The finish features mouth coating chocolate-covered cherries and stone fruits that linger until the next sip. As the wine warms in the glass over time, the alcohol peeks out, so best to drink this one cool. This Pinot will appeal to those who prefer a fat and opulent style of Pinot Noir that is interesting to drink on its own or can match up with a big hunk of grilled beef. This is a young vineyard of great promise and with several winemakers at work, will offer a unique interest to those who look to winemaking style for added variety from a single vineyard (similar to the Shea Vineyard). Wine may be ordered on the website at www.lecadeauvineyard.com. There is also some retail distribution (www.hitimewine.net, www.avalonwine.com). 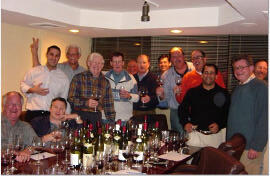 Registration for the 2007 World of Pinot Noir (WOPN) in Shell Beach, California, slated for Friday, March 2 and Saturday Mar 3, 2007, is now open. Event information and tickets are available now at www.wopn.com. I have attended this event in the Central Coast of California practically every year since its inception and I consider it one of the top Pinot Noir Festivals for pinot geeks. This year the featured Burgundy tasting on Saturday morning with Allen Meadows (aka the burghound) is The Wines of Domaine Comte Georges de Vogué and Domaine Michel Gros ($225-$285 pp). This is always the highlight of WOPN. Meadows interacts with the French winemakers (in this case Jean-Luc Pépin of de Vogué and Michel Gros) to offer an instructive and insightful tasting of these superb Burgundian wines. Lunch follows the presentation, accompanied by more wines from the two Domaines. Friday night is the Gala Pinot Noir Dinner at The Cliffs Resort. This year the featured chef is Mark Peel whose resume includes Wolfgang Puck’s Ma Maison and Spago, as well as Chez Panisse and his own Campanile Restaurant in Los Angeles. He was honored as Chef of the Year 2005 by the California Restaurant Association. Pinot Noir producers host individual tables and bring library wines to sample. Participants also bring Pinot Noirs to share. The evening has a ribald atmosphere of conviviality and unmitigated Pinot Noir indulgence ($185). Saturday night the event concludes with a Santa Barbarastyle Paulée Dinner at Au Bon Climat Winery at Bien Nacido Vineyard in Santa Maria. Every attendee brings a special bottle to share here also, many large formats are uncorked, and an all-star team of local chefs provide a buffet feast. Bus transportation to and from the Paulée is offered and absolutely required ($185). On Friday and Saturday afternoons there are walk-around Pinot Noir tastings in two large tents erected on the grounds of The Cliffs Resort overlooking the ocean. The list of participants reads like a who’swho of Pinot Noir including Arcadian Winery, Au Bon Climat Winery, Belle Vallee Cellars (Oregon), Bryce Vineyard (Oregon), Byron Winery & Vineyard, Domaine Alfred, Elk Cove Vineyards (Oregon), Etude Wines, Fiddlehead Cellars, Flowers Vineyards & Winery, Goldeneye Winery, Hitching Post Wines, Koste Browne, Lane Tanner Winery, MacPhail Family Wines, Melville, Miner Family Vineyards, Native 9 Vineyards & Winery, Papapietro Perry, Patz & Hall Wine Co, Paul Hobbs Winery, Peay Vineyards, Saintsbury, Sea Smoke, Talley Vineyards, Testarossa Vineyards, The Donum Estate, Vision Cellars, and many, many other small boutique producers. A full list is posted on the website. Do NOT procrastinate as attendance is limited and tickets sell out quickly every year. The Cliffs Resort (800-826-7827) is holding a block of rooms ($180-$220) and is a good place to stay for convenience, but there are many other inexpensive accommodations within walking distance. Also, the new luxury Blue Dolphin Bay Resort next door has modern condo-style one and two bedroom rentals available ($280-$600) as well as Chef Evan Treadwell’s new Lido Restaurant. Through my years of experience in teaching (ocular disease to optometrists), I realize that test questions must have iron clad specificity and correctness. It was no surprise to me that several readers responded to the recent Pinot Noir IQ Test challenging some answers (correctly so) and requesting clarification of other questions. I wanted to share this information as a useful learning experience and truly appreciate those who took the time to write. There are many whose knowledge of wine knows no bounds and I am reminded of the old saying, “Knowledge (experience) is something you don’t get until just after you need it.” I have posted the revised Test in Volume 5, Issue 51on the website (www.princeofpinot.com), with all of the correct answers on page 10 of that issue. Question #1 The question now reads: “All of the following are mutations of Pinot Noir except:” Rod Berglund, winemaker at Joseph Swan Vineyards correctly pointed out that Pinot Noir is not a parent, that is, did not cross pollinate with another grape to produce Pinot Gris, Pinot Blanc and Pinot Meunier. These three varieties are pigment phenotypes which are genetically identical to Pinot Noir and differ only in pigmentation. They are mutations rather than offspring. Grenache, of course, is the answer as it is genetically unrelated to Pinot Noir. Pinot Noir is a genetic parent of Chardonnay, Gamay, Aligoté, Melon, Auxerrois, and several other varieties. The other parent is Gouais, a white grape now practically extinct in northern France. Question #2 I left this question as is and the correct answer is that the juice of Pinot Noir is colorless. Technically, this is not always the case. Rod Berglund noted that a “tenturier” version of Pinot Noir exists whose juice is red. In an aerial photograph of the Cotes de Nuits, Rod noticed a block of vines that appeared to be totally virused. He was told that they were not virused, just an illegal planting of Pinot Noir tenturier. Rod suspects that he also has a mutant vine in the oldest block of his vineyard, since every year he notices a red splotch in a picking box that is way too dark to be normal Pinot Noir juice (he has yet to find it, however). Question #7 This question now reads: “Pinot Noir as a stable variety is probably indigenous to:” The exact origins of Pinot Noir are not known, but John Haeger, author of North American Pinot Noir, has stated that Pinot Noir originated as a stable variety in Burgundy. In his book, Haeger writes that “the accepted opinion of most wine historians and paleobotanists was that all vinifera had a common geographic origin - in Transcaucasia, between the Black and Caspian Seas, where modern Turkey, Iraq and Iran share borders.” Greek and Roman travelers then brought cuttings, wine and culture into Western Europe. Haeger goes on to point out that there is some conflicting information. There is evidence that grapes were cultivated and wine made in some parts of France before the first Greek settlements could have had such an impact. Also, there are extensive populations of wild vines throughout large parts of Western Europe and it is unlikely that migrants from the eastern Mediterranean would have carried wild vine cuttings on their travels. Wild vines of Vitus vinifera could have existed long before the Greeks and Romans came to Western Europe. Question #19 This question now reads: “The approximate number of days from bud break to harvest in North America is:” The original answer of 100-110 days was incorrect as pointed out by an astute reader. 100-110 days would be the number of days from bloom to harvest rather than bud break to harvest which is much longer. There are four markers in the vine’s annual growth: bud break, bloom (berry set), veraison (the change in grape’s color), and harvest. Bud break can begin as early as the end of February in the south central coast of California and as late as the first week of May in the Finger Lakes region of New York. The number of days from bud break to harvest can have a range of roughly 170-200 days. The period from bloom to harvest is known as hang time and will range from 90-125 days (answer c). Long hang times are correlated with cool summer daytime maximum temperatures as found in the south central coast, the Sonoma coast, and cooler parts of the Russian River Valley. The period from veraison to harvest is 28-49 days. Pinot Noir at veraison photo below. Question #23 The correct answer is d (pineapple). The secondary flavor characteristics of Pinot Noir are varied and can include leather, game, rotting vegetables, beef bouillon, pencil shavings, loamy earth, pipe tobacco, old library books, brown sugar, mushrooms on a grill, beef stew, smoked bacon, vitamin tension, rust and iron, root beer, anise, fig, sherry and molasses. Question #32 Amber Ridge Vineyard is located in the Russian River Valley and is the correct answer (b). The Sangiacomo Family vineyard holdings require some clarification. The family’s original plantings were in the Los Carneros AVA on the western side of Sonoma Creek (now over 1,000 acres). The family also farms vineyards in the Sonoma Valley and in 1998, they planted Pinot Noir in the Sonoma Coast AVA on Roberts Road. As a result, you will see Sangiacomo Vineyard on vineyard-designate Pinot Noirs from both the Carneros and Sonoma Coast appellations. Angelo Sangiacomo, now 76 years old, was inducted into the Sonoma County Farm Bureau’s Hall of Fame last year. Considered a pioneer in the wine industry in Sonoma County, Angelo takes pride in the fact that his vineyards have remained a family-owned business since his parents planted their first fruit orchard in 1927. Sangiacomo grapes are highly prized by winemakers. 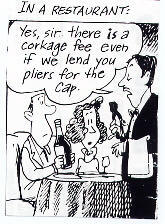 Look for Pinot Noir IQ Test #2, in a future issue of the PinotFile.